The level of appreciation for the Mercedes-Benz marque continued to grow in 2015. While there were no headline sales such as the Mercedes-Benz W196R that sold for a world record £19,601,500 at Bonhams’ 2013 Goodwood Festival of Speed sale, this year still provided many great offerings that represented the brand well. 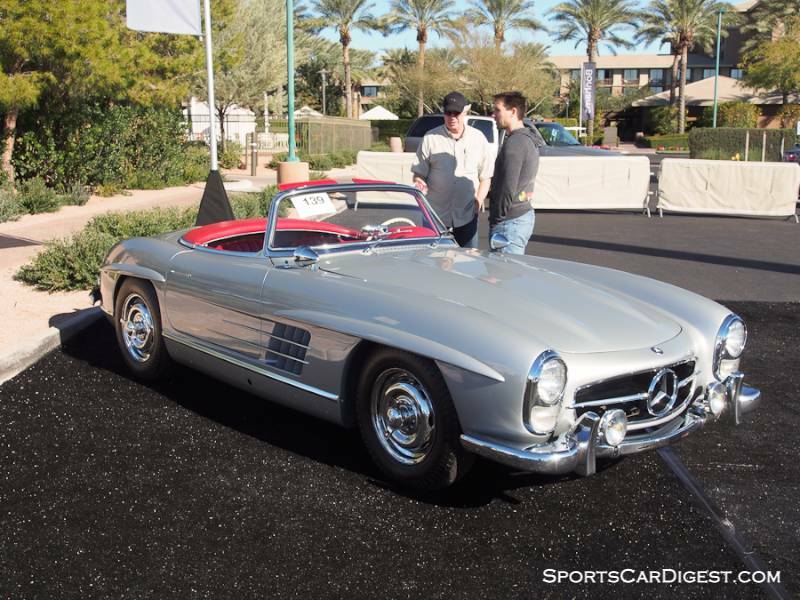 Lot # 139 1958 Mercedes-Benz 300SL Roadster; S/N 1980428500094; Engine # 1989807500682; Silver-Grey/Red leather; Black cloth top; Estimate $1,200,000 – $1,400,000; Visually maintained, largely original, 3+ condition; Hammered Sold at $1,125,000 plus commission of 10.00%; Final Price $1,237,500 – Chrome Rudge-style centerlock wheels, Dunlop blackwall tires, Becker Mexico AM-IM, dual outside Talbot mirrors, two tops with the original shipping crate for the hardtop, books and tools. – Orderly, clean engine sitting in a superficially resprayed compartment. Good chrome, older paint and well-preserved original interior. A quality driver. – Pleasingly presented without excessive flash and glitz, this is an unusually satisfying 300SL Roadster in its original color and with the factory interior. It would be hard to ask for more, even at this price. 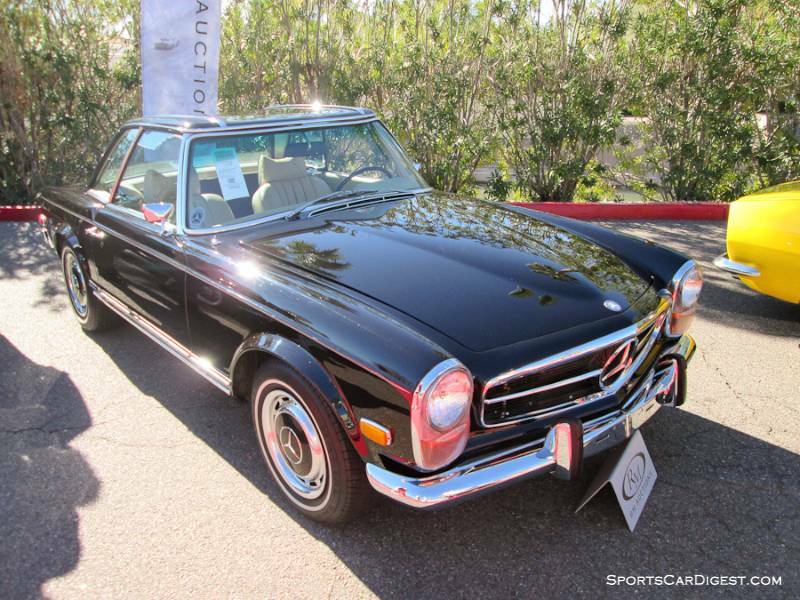 Lot # 213 1970 Mercedes-Benz 280SL Roadster; S/N 11304412012342; Engine # ; Maroon, Maroon hardtop/Beige vinyl; Brown cloth top; Estimate $125,000 – $175,000; Visually maintained, largely original, 3- condition; Hammered Sold at $110,000 plus commission of 10.00%; Final Price $121,000. No Reserve – Automatic, Becker Europa radio, A/C, whitewall tires, hardtop with heated rear window, soft top, documents and service history. – Some minor dings, paint has dull areas and chips, dinged chrome, undetailed engine compartment with overspray from the repaint, dirty chassis, driver’s seat looks overstuffed when it was redone, weathered interior trim pieces. A barely driver quality cosmetic restoration. – This fits the definition of ‘just a car’, but not the price. It would have been reasonably bought at $75,000, not $110K hammer. The estimate range – for its condition – is Absolutely Fabulous, but maybe it had the desired effect on the bidders chasing a No Reserve deal. They didn’t get it. 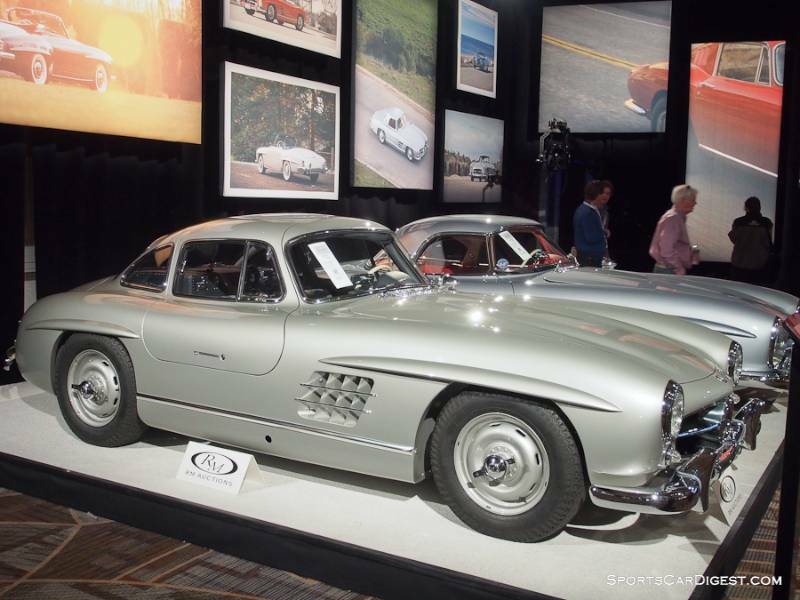 Lot # 238 1955 Mercedes-Benz 300SL Gullwing; S/N 1980405500594; Engine # 1989805500621; Silver/Blue Plaid; Estimate $1,450,000 – $1,650,000; Cosmetic restoration, 2- condition; Hammered Sold at $1,350,000 plus commission of 10.00%; Final Price $1,485,000. – Rudge-style centerlock wheels, Dunlop SP blackwalls, blue leather fitted luggage, belly pans, tool kit, owner’s manual. – Presented in reverse of its original colors, with silver paint, body color painted wheelwells and blue seats, but beautifully clean and correct. Clear evidence of careful husbandry, a consistently maintained and refurbished as needed Gullwing that has never had, or needed, a full restoration while being ministered to by recognized experts. Orderly but not overdone underhood. – Sold by Bonhams here in Scottsdale a year ago for $1,078,000, subsequently reupholstered in blue plaid instead of the leather it had then (the leather comes with it.) Even considering commissions and the recent work the seller cleared $200,000, but the new owner also got full value for the price paid. Lot # 244 1962 Mercedes-Benz 190SL Roadster; S/N 12104010024330; Engine # 12192810002250; Pearl Gray/Green leather; Green top; Estimate $175,000 – $225,000; Recent restoration, 2 condition; Hammered Sold at $165,000 plus commission of 10.00%; Final Price $181,500. No Reserve – Blaupunkt radio, fitted luggage, wheel covers, whitewalls, well documented. – Freshly restored, uniform gaps and lines, chrome has only trivial flaws, fresh, correct interior, engine is correct down to the hose clamps. High quality and hard to fault. – A very good, honest 190SL with two long term owners in Canada. The catalog opines that the 190SL ‘offers most of the thrills of its big brother’ which is a bit of a stretch, like comparing a Pinto with a Thunderbird: they both drive at highway speeds. In any event, this is what a sound, honest 190SL is worth today, and maybe even a bit of a good value for the new owner. 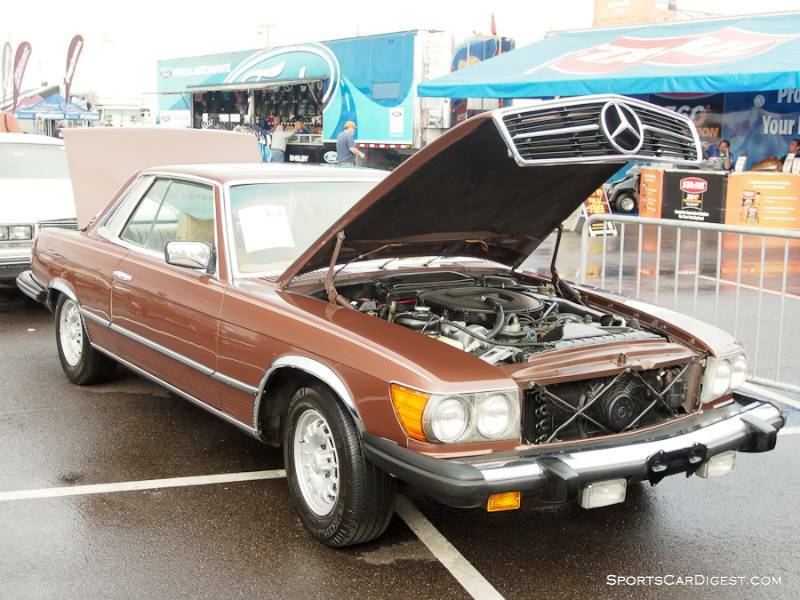 Lot # 1.1 1978 Mercedes-Benz 450SLC Coupe; S/N 10702412020680; Brown/Beige leather; Visually maintained, largely original, 4+ condition; Hammered Sold at $4,000 plus commission of 10.00%; Final Price $4,400. No Reserve – Automatic, P/S, P/B, A/C, Becker Mexico cassette stereo, alloy wheels, Michelin radial tires, sliding sunroof. – Decent older repaint with edge chips. Tired, tom leather, faded dashtop. Aged body seals. Tired but sound. – New leather is a must (but a few sheepskins would cover up the tears and escaping padding, which is what usually is the case with cars like this.) With over 200K miles service is a valid concern. It would make a good airport car (‘Go ahead and steal it’) and it’s barely more than half the price of the golf cart. 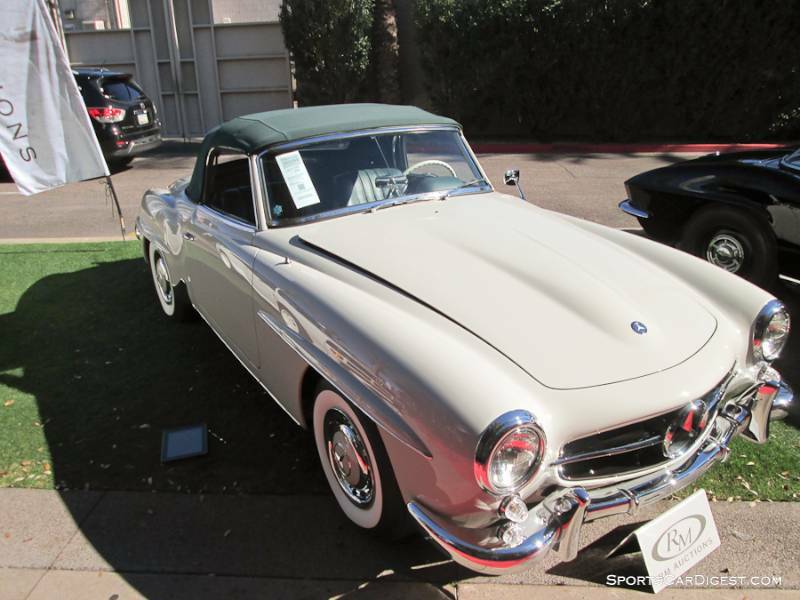 Lot # 5022 1961 Mercedes-Benz 190SL Convertible; S/N 12104010019587; Ivory/Red leather; Black cloth top; Recent restoration, 2+ condition; Hammered Sold at $140,000 plus commission of 10.00%; Final Price $154,000. No Reserve – Clarion AM-FM, hubcaps, trim rings, narrow whitewalls, two tops. – Freshly restored with excellent paint, chrome, interior and top. Sharp and crisp underhood with polished cam cover. Underbody is better than new. Both door fits are off, though. – Attractively restored and presented even with the erratic door fits, this result is a representative number for a 190SL today. 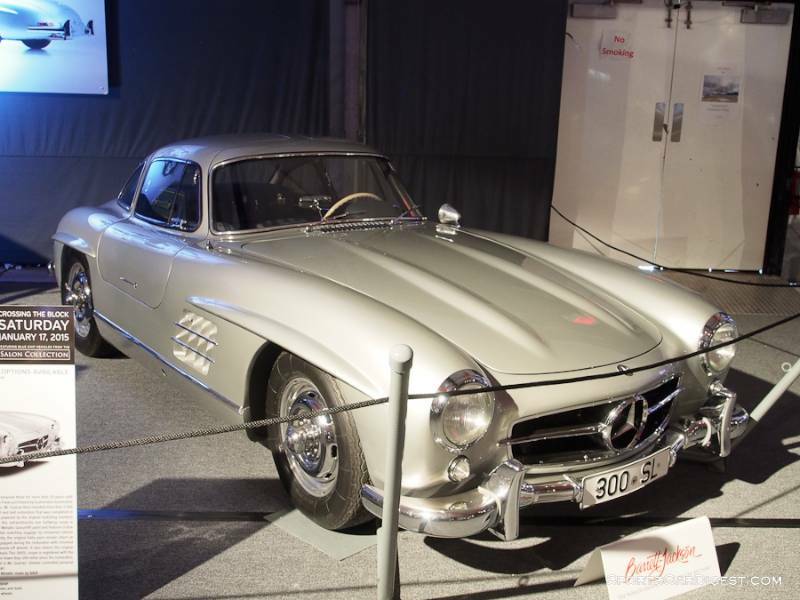 Lot # 5075 1955 Mercedes-Benz 300SL Gullwing; S/N 1980405500606; Silver/Blue plaid; Older restoration, 2 condition; Hammered Sold at $1,000,000 plus commission of 10.00%; Final Price $1,100,000. With Reserve – Becker Mexico radio, chrome Rudge-style centerlock wheels, Michelin XWX blackwall tires, hinged steering wheel, fitted luggage. – Better than in Monterey, with a new interior and thoroughly detailed. – Reported sold at Mecum’s Monterey auction last August for $1,193,250 with the Blue leather interior it wore then now accompanying it in a box, it looks better with plaid (and will be more comfortable.) Why the consignor decided to take a $200,000 hit after just five months is a mystery but the buyer got the advantage of a very good Gullwing for a moderate price. 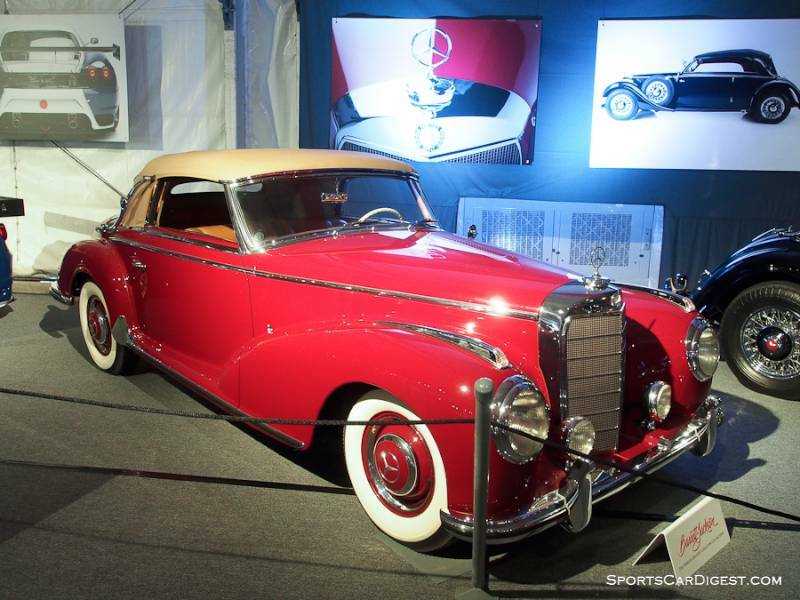 Lot # 5076 1953 Mercedes-Benz 300S Cabriolet A; S/N 1880100020253; Dark Red/Tan leather; Beige cloth top; Recent restoration, 1 condition; Hammered Sold at $585,000 plus commission of 10.00%; Final Price $643,500. With Reserve – Hubcaps, trim rings, whitewalls, 4-speed, fog lights, Becker Nurburg radio, heater. – Excellent paint, chrome, interior and top. Underbody is like new. Beautiful blonde burl interior woodwork. A wonderful specimen. – Even at this price the new owner got plenty of Fifties Mercedes-Benz performance, luxury and exclusivity for the money. It would still have been a realistic acquisition at another $50,000, it’s that good. I can’t exaggerate how much I learn from your commentaries. 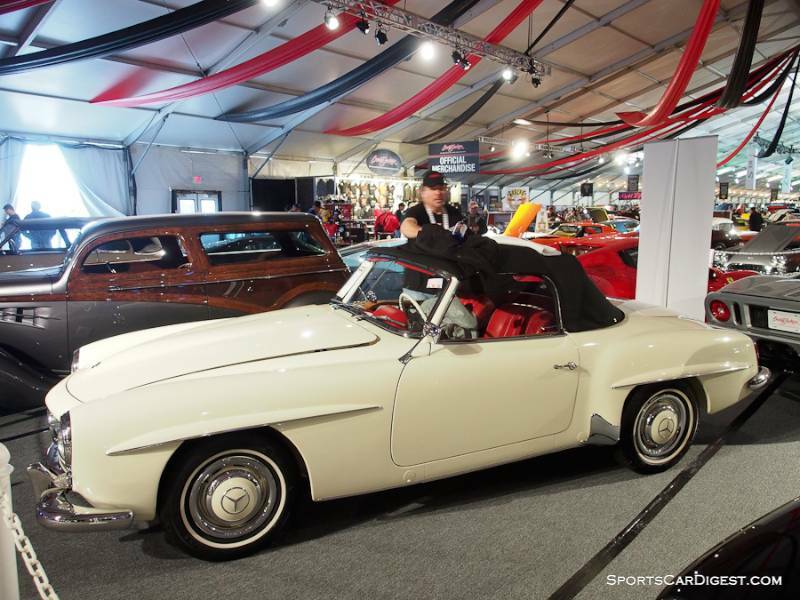 Rick, Which auction house that will be at Monterey in 2016 would be the best one to offer a mid-1950’s sports racing car that is actively being raced? I’m thinking Rick Cole or Bonhams.